How Happy is Estonia ? In a small Himalayan nation of Bhutan sandwiched between two giant and competing economies India and China, an idea was conceptualized of Gross National Happiness in which happiness is the fundamental human goal. The king of Bhutan Jigme Singye Wangchuck, said: "Gross National Happiness is more important than Gross National Product". Estonia a small country in Northern Europe, a well-developed country which is growing rapidly in the last few decades. From the lens of a foreigner, it can be seen that Estonian are reticent. Some say this is due to the gruesome history of Estonia which was pretty unstable which ultimately led to the development of this distinct character. While some say its due to harsh weather and people are relatively happy in summer than winter. So let's have a look whether there is any scientific explanation to that with the lens of Gross Happiness Index. World Happiness Report relies mainly on the survey conducted by Gallup World Poll(GWP). Social support (or having someone to count on in times of trouble) is the national average of the binary responses (either 0 or 1) to the GWP question “If you were in trouble, do you have relatives or friends you can count on to help you whenever you need them, or not? Healthy Life Expectancy (HLE). The time series of healthy life expectancy at birth is calculated by the authors based on data from the World Health Organization (WHO), the World Development Indicators (WDI), and statistics published in journal articles. Generosity is the residual of regressing national average of response to the GWP question “Have you donated money to a charity in the past month?” on GDP per capita. Each country is also compared to a hypothetical nation called Dystopia. Dystopia represents the lowest national averages for each key variable and is, along with the residual error, used as a regression benchmark. In 2017 World happiness Report Estonia is ranked 66th, In the year 2016 Estonia was ranked 73rd and the year 2015 Estonia was on 73rd position worldwide. Let's look closely at the Estonia figures for 2016 and 2017. TABLE 1, Source: World Happiness Report 2016 and World Happiness Report 2017. As it could be seen from Table 1 that most of the data support an upward swing of the happiness Index for Estonia which translates that Estonia is becoming happier and happier. Perception of Corruption is almost same after 1 year but there is an increment of approximately 45% in the Social Security index which shows a very positive sign for the happiness among Estonians. If we just look at the position of Estonia in each and every 6 categories in 2017. Ranking of Estonia on the basis of all these six indicators suggests that in five out of six Estonia is better than its Ranking on World Happiness Index. But the rank of 136th in generosity reflects the reason for the position of 66th despite doing so well in other indicators individually. Freedom of Choice is one of the most vital prerequisites for a happy society. Estonia’s rank of 53rd actually is quite an improvement from the previous survey. There is approximately 15% increase in Estonia score in just one year, Only 3 year of similar growth will make Estonia one of the top most country in this index. This growth of Freedom is actually quite visible in Estonian especially in the field of Information Technology, Tallinn the Capital of Estonia is a popular startup destination in Estonia and it's commonly known as the startup capital of Europe. Estonia is ranked 50th in this Index, In the World Happiness Report 2017, WHO 2013 data is used. But as we look at the report World Health Organisation published in 2016, Estonia is ranked 40th, which is a jump of 10 places which is quite a success in just 3 years. But there is a very important observation that In the WHO report of 2016. 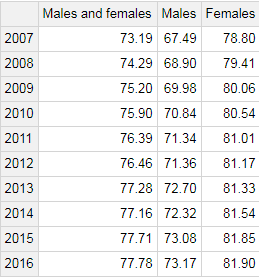 If we just look at the Life Expectancy of just Female then Estonia is ranked at 30 with 82 years and for Male its ranked 65th with 72.7 years, there is a whopping gap of almost 10 years between male and female Life Expectancy. But looking at the trend of Male and Female Life Expectancy in Figure 2 We can see that Male life expectancy is increasing. In terms of Generosity Estonian are a reserved and it's completely visible in their rank of 136th. It can also be seen in the World Giving Index 2017 published by Charities Aid Foundation. Estonia is ranked 100th overall in 2017 and 116th overall in 2016. So we can see a slight improvement there. But Estonia has a long way to go in this way. And I hope there will be further studies explain the reasons behind reservation of Estonians regarding charity. While in Myanmar 91% of the population donate money in Estonia it is just 22% of the population who donates money. Christopher McCandless had written in his diary that “Happiness only real when shared”. In conclusion, it can be said that Estonia is improving in almost all the indicators, and could easily manage to be among top 30 happiest countries in next 5 years given the current trends but to be one of the top Happiest countries Estonia has a room of improvement especially in the indicator of Generosity. Dorji, Tashi (15 June 2012). "The story of a king, a poor country, and a rich idea". Business Bhutan. Retrieved 1 April 2017. "Happiness : towards a holistic approach to development : resolution / adopted by the General Assembly". UN DAG Repository. "Life expectancy increased by 5 years since 2000, but health inequalities persist". WHO. 19 May 2016.